Danny Morrissey rifled Limerick to a late but deserved point as they drew 1-1 with Shamrock Rovers in the SSE Airtricity League Premier Division at Tallaght Stadium on Friday night, as they ended a two-month wait for a goal on the road. Rovers made the breakthrough on the quarter-hour when Graham Burke’s bullet from range went in off the post, and they would have been two ahead but for a fantastic save from Brendan Clarke which denied Lee Grace’s header. After the break, Limerick should have been level when Shaun Kelly put it on a plate for Morrissey but the attacker failed to finish. Gary Shaw was guilty of the same at the other end, and that would prove a costly miss as Morrissey popped up with an 86th-minute equaliser. Limerick manager Tommy Barrett made two changes to the team that lost to leaders Dundalk just over 72 hours earlier as Darren Dennehy and Morrissey came in to replace Kelly and Tony Whitehead, who was unavailable for the first time this season with a hamstring injury. The Shannonsiders made a confident start but it was Rovers who had the first sights of goal, with Burke blasting wide before Aaron Bolger sent an effort the same way. There was a lucky escape for the visitors shortly after when Seán Kavanagh fired over after the ball fell to him at the back post. But there was no stopping Rovers’ opener on 15 minutes. After appearing to deal with the danger as Roberto Lopes’ back-post shot was blocked by Clarke on the line, the ball eventually came to Burke 25-yards effort and he drove a delightful left-footed strike in off the upright. Limerick’s plans were further disrupted on 26 minutes when Conor Clifford was forced off with injury. Then Clarke produced heroics to get across and tip over Grace’s header which looked certain to find the net. The Superblues stopper then denied Burke, from a tight angle, and Kavanagh whose effort from outside the box took a deflection which almost wrong-footed him on the line. In a change of tactics, Barrett introduced Kelly eight minutes before the break as both he and Billy Dennehy moved to wing-back positions. But it was Rovers who could have added to their lead before half-time only for Clarke to again block Burke. On 47 minutes, captain Shane Duggan just failed to find the target after Will Fitzgerald’s right-wing cross, in a rare opportunity for Limerick. And the Superblues had an even better chance before the hour-mark when Kelly’s pinpoint cross to the back post found the head of Morrissey but from close in he directed his effort straight at the ‘keeper. Rovers responded with a fierce Burke strike going narrowly past the top corner, before Limerick had a let-off as Shaw could only hit a weak effort at Clarke after Ronan Finn’s precise pass had handed him the opening. 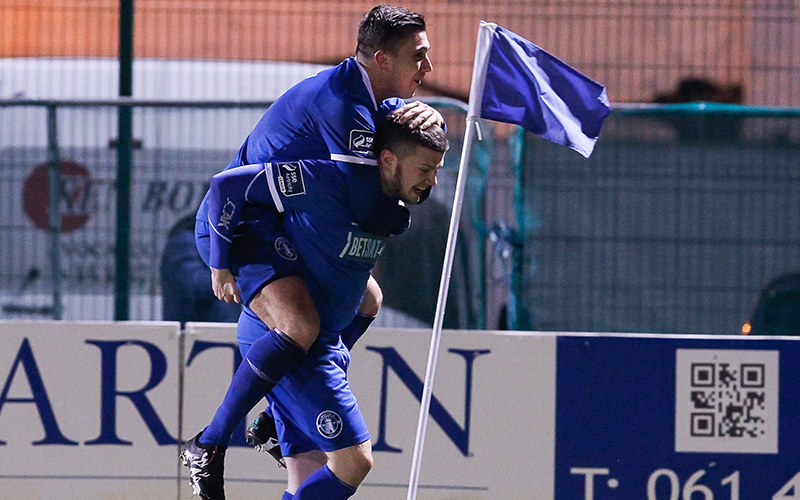 And Barrett’s side got the leveller that their second-half efforts deserved four minutes from time when Wearen found the feet of Morrissey who turned smartly before rifling beyond Kevin Horgan. On the 90, Limerick were reduced to ten men when Cían Coleman was shown a straight red card, but they held out to earn a share of the spoils. Shamrock Rovers: Kevin Horgan, Ethan Boyle, Lee Grace, Roberto Lopes, Ally Gilchrist, Graham Burke (David McAllister 80), Aaron Bolger, Greg Bolger, Ronan Finn (Sam Bone 80), Seán Kavanagh, Gary Shaw (Dean Dillon 77). Goal: G Burke (15). Booked: None. Unused Subs: Tomer Chencinski (GK), Brandon Miele, Joel Coustrain, Joey O’Brien. Limerick: Brendan Clarke, Kilian Cantwell, Killian Brouder, Darren Dennehy, Billy Dennehy, Connor Ellis (Shaun Kelly 37), Conor Clifford (Eoin Wearen 26), Cían Coleman, Shane Duggan ©, Will Fitzgerald, Danny Morrissey (Barry Maguire 90+2). Goal: D Morrissey (86). Booked: S Duggan (17), E Wearen (89), B Dennehy (90). Unused Subs: Tommy Holland (GK), Shane Tracy, Karl O’Sullivan, Adam Foley.